The Holiday Inn Phoenix North is the perfect location for your special day and event we are located off I-17 and Cactus exit 209, just 14 minutes from downtown Phoenix and 16 minutes from Sky Harbor Airport. We are a full service hotel which offers our new Pickleback Bar & Grille Restaurant serving all American Food. 2,550 sq.ft. 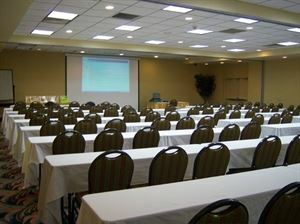 of meeting room space and on-site catering for any occassion. Other amenities include in our guest rooms as flat screen Televisions, microwaves, mini refrigerators, heated outdoor pool/spa, fitness center, business center, coin operated guest laundry. The Holiday Inn Phoenix North would like to welcome future Brides to come and see what a beautiful Hotel this would be for your special day. We can offer catering services to fit your needs and make your day a very special one to remember. Call Melissa our Catering Sales Manager to set-up an appointment and check out the Ballroom and catering menu's. Special Features: The Pickleback Bar & Grille has a Bar and Lounge, an outdoor Patio for cocktail hour after your ceremony and before your reception in the Ballroom, complimentary Wifi, luxury guest rooms.